A hot, humid 2010 summer day in Houston could not dampen my excitement. A book I had ordered had just been delivered. 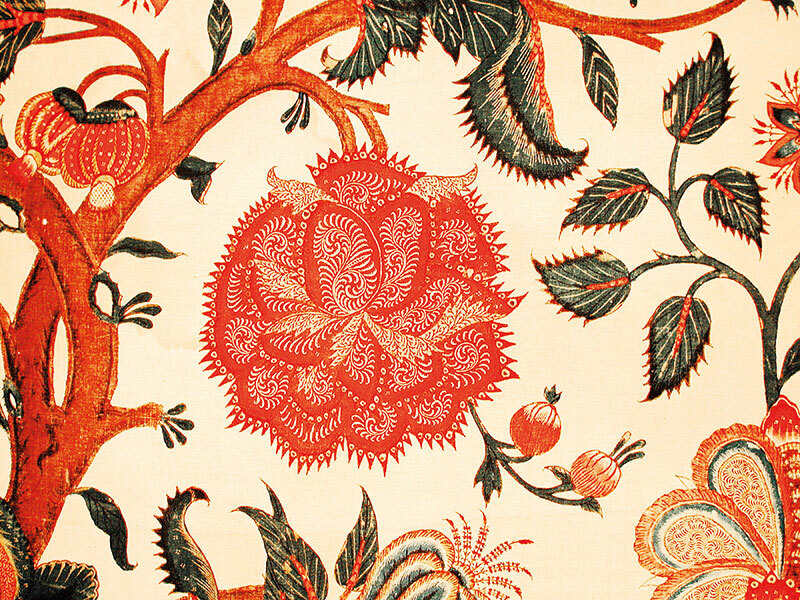 It was Chintz: Indian textiles for the West written by Rosemary Crill and published by the V&A. The cause of my quickened pulse and hungry eyes were visions of undulating trees laden with unimaginable, exotic flowers and leaves, mischievous birds and animals in resplendent colours, coming together on fabric. 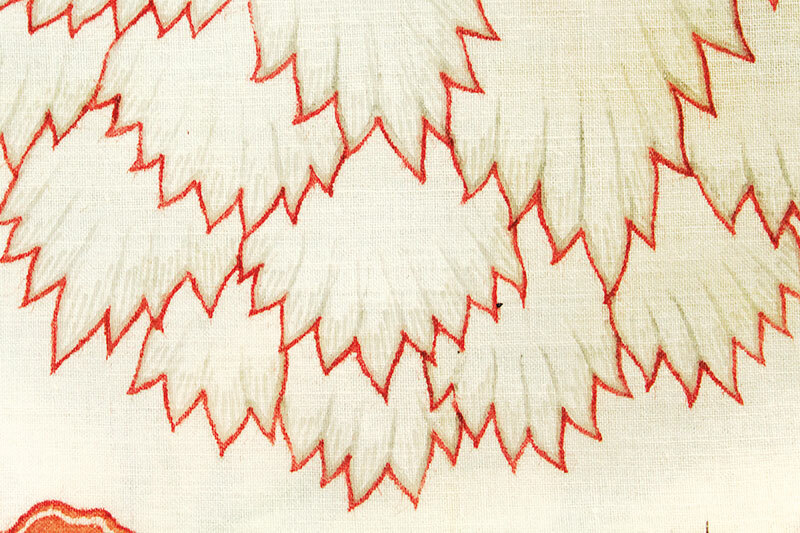 As I contemplated ideas I wanted to pursue when I relocated to India in a few months, I knew I wanted to make this beautiful textile as our forebears did in the 17th and 18th centuries. And so my obsession began to grow with every new discovery. The demand for chintz caused a far-reaching ripple. It inspired the development of copperplate process and roller-printing machines in Europe followed by the rise of the batik industry in Indonesia, which eventually led to a decline in demand from late 18th century. The ban in Persia prohibiting the import of chintz in 1924 was the final nail in the coffin. Painting traditions almost disappeared until 1954, before an intervention by Kamaladevi Chattopadhyay and the government of India. Inspired by its historical significance, I set out to find a craftsman to make my dream come true. Travels to Machilipatnam and Srikalahasti, two centres where the craft is still practised today almost made me give up as a couple of realisations dawned on me. First, the craft had morphed into a simplified version. Chemical dyes had largely replaced natural dyes, for the two most important colours — red and blue — and the art of fine wax resist which produced the delicate white lines so quintessential in chintz were no longer practised. Second, it was clear that the beauty of chintz is inextricably tied to the techniques used to make it. But there was no one who knew how to produce chintz in the historic process in this day and age. This was a huge roadblock. I realised this was an opportunity to work hands-on, to explore, to discover and to walk in the footsteps of our traditional craftsmen — the closest I could get to the people who continue to inspire me. Relying on two historical accounts from the 18th century written by a French Jesuit missionary and a French naval officer, I delved into buffalo milk, dung, madder, indigo and other natural materials to experiment and understand the chintz-making process. Seeking the unknown has been an adventure — studying the best chintz collections in museums and the wax resist technique used to make Batik Tulis in Indonesia; making mistakes only to learn something new; and, above all, the joy of discovery. Painting with a kalam (pen) brings its own rewards, a meditative stillness in body and mind. The process of making chintz constitutes a series of complex steps. It starts with 100 per cent hand-spun and handwoven cotton cloth which is washed, bleached using dung and sunlight, soaked in myrobalan (a tannin source) and buffalo milk, and dried in sunlight. The fat in the milk allows watery mordants (an adhesive compound that helps fix dye) and dyes to be painted on cloth without spreading. ‘Handpainted’ to the uninitiated might imply that dyes are directly painted on cloth, when in fact mordants are painted first and the whole cloth is then dyed. Outlines and filling are painted and dyed in several dye baths. Fermented iron is used for black, alum for reds and a combination of the two creates a myriad of colours — browns, purples, burgundy, and pinks. I find this to be one of the best steps in the chintz-making process. To see a number of shades develop in one dye bath is truly magical. Cloth was dyed in a bath of chay root, causing the alum-painted areas to turn red and blacks to deepen. Since chay is no longer commercially cultivated, I use madder as a source of red instead of synthetic alizarin used by traditional craftsmen today. To get fine white lines, wax lines that act as a resist are drawn. In between dyeings, cloth is bleached with dung and sunlight which leaves the background pristine white, another magical step. Historically, all areas that are not blue are covered with wax and the cloth dipped in an indigo vat. How wax could be applied on large areas without cracking is a mystery that occupies me at the moment. Finally, myrobalan or pomegranate dye mixed with alum is painted in areas to be yellow and overpainted on blue areas for green. Yellow is the only colour that is painted versus dyed. After washing and bleaching for the last time, cloth is starched and polished to give a glaze finish. We will never know how, when or who identified that the fat in buffalo milk stops the spreading of mordants when painted on cloth. Or that myrobalan and alum are mordants that help fix dyes to cotton. It’s impossible not to wonder who discovered that dung and sunlight could bleach the areas that are untreated, or the technique and tools to draw wax lines finer than a pen could draw. This brilliance and ingenuity encourages me to constantly search and experiment for that perfect combination of materials. 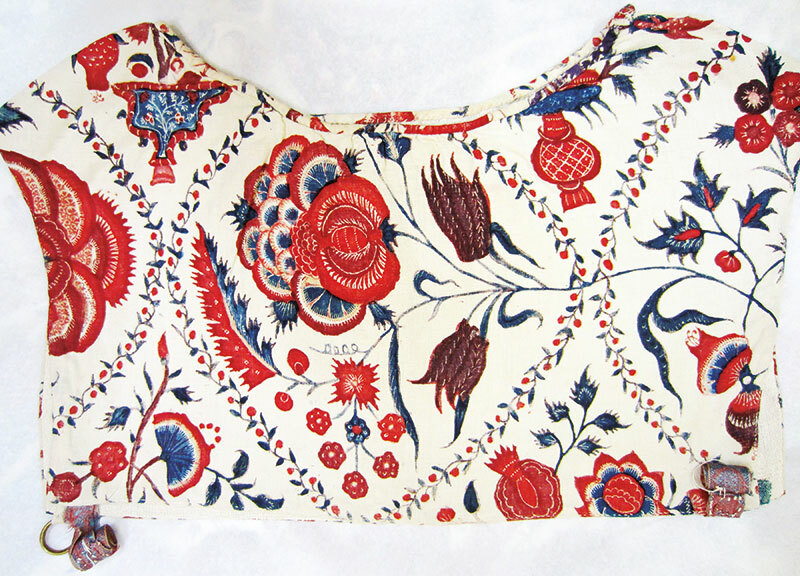 While historical chintz was identified by technique, present-day kalamkari is identified more by aesthetic. This explains why digitally and screen printed fabrics with kalamkari motifs are more widely available. 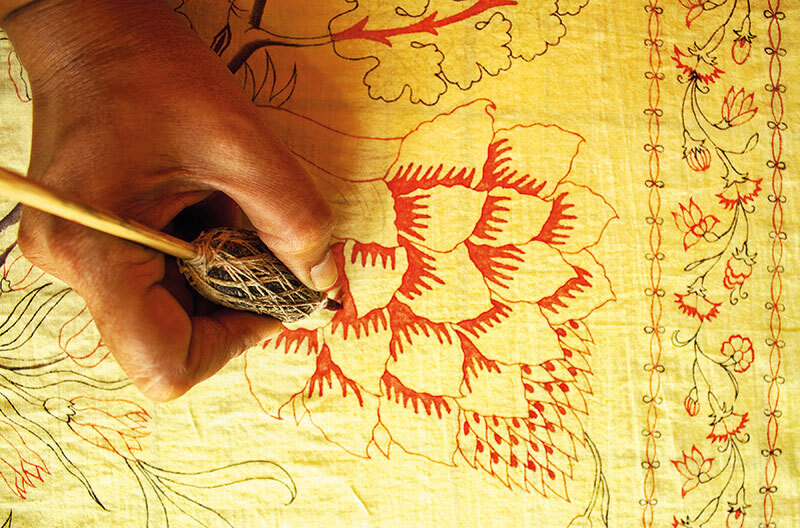 Or why alizarin, a chemical dye for red, which is more often painted than dyed, is accepted as a norm and why most kalamkari training centres today place greater emphasis on drawing rather than dyeing skills. Enchanted by the beauty of historical chintzes, I ask “Is it possible to produce 18th-century-quality chintz today?” The answer lies in unearthing its lost techniques.